Posted 1:28 pm by ENDURrun & filed under 2018, Contender. This is the second post in our daily Contender series. Here is the full list of Contenders. Lumi Duca has a lot of ENDURrun experience for an Ultimate Rookie, having competed in the relay each of the past three years, including two Stage 7 marathons. Welcome Lumi! Lumi: I had a stress fracture last fall and I missed running over the winter. So I thought I have to run something different and challenging this summer as a come back and to celebrate being able to run again. What are your motivations and goals for this ENDURrun 2018? Motivation: I have to do it at least one in my life; it is right here at home! Goals: I just want to finish every day wanting to go back for the next stage. The runner’s high! and the yummy food the volunteers are preparing! I am worried that my leg will not hold for the training and that the stress fracture would come back; before or during the race. I think everyone is the same after an injury; you feel it long after it is gone. I am planning to run 90 – 120 km / week which will include hills and trails. Look for us to follow up with Lumi in August on how much she wants to come back each day – especially after Stage 5! Posted 2:11 pm by ENDURrun & filed under 2018, Contender. There are many runners and many races, but only a few contenders for the high honour of One Tough Runner. This spring we will be profiling the 2018 ENDURrun Ultimate Contenders with Q&As in this blog. This interview with Nikkole Welsh is the first in the series – enjoy! Nikki has completed the Ultimate twice, in 2015 and 2016. After a one-year hiatus, she’s back and excited for ENDURrun 2018. Nikki: I used to run in high school with my step-dad around the river in Stratford. Then I started running again after my second baby and I’ve been running ever since. Now I run as a stress reliever and a way to take care of myself. I’m looking forward to seeing all of those familiar faces again! How will your ENDURrun 2018 compare to 2015/2016? My motivation is always to show my three boys how important it is to be healthy and show them how strong women can be. This year I’m running in the Outrun Trail series so training started early, and is going well!! I’m currently running over 100km a week in anticipation of my first race at the end of April. Don’t underestimate your own strength. It’s all about mind over matter. The Schmidt family and the incredible volunteers!! You feel like you’re part of something really special, and by the end of the week everyone knows your name and everyone is supporting each other. It’s a pretty beautiful thing! Posted 10:45 am by ENDURrun & filed under 2018. We are pleased to announce the return of Robert Brouillette and Vicki Zandbergen to ENDURrun in 2018. Both athletes are valued alumni to whom we have become accustomed to seeing on the start line, year after year. Notable is that 2018 will be only the 5th year in ENDURrun history that both male and female winners from the previous year will return to defend their title. Robert is gunning for the 4-peat (four consecutive championships), which has never been accomplished by any man or woman. His first completion in 2015 was the 3rd fastest all-time, an accomplishment which he has since repeated in 2016 and again in 2017. Vicki is on track to complete her 8th consecutive ENDURrun, which is a record that she would set and share with Wilf Goron if they both complete the 2018 competition. Her most recent time (2017) is the 10th fastest all-time. Here are a few photos from a fun shoot we did in August 2017, after their ENDURrun wins. 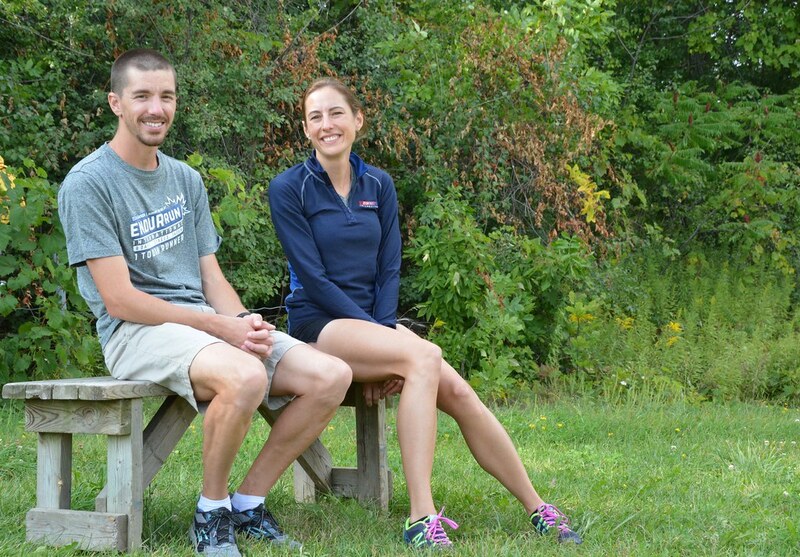 So many factors contribute to an athlete’s ability to participate in ENDURrun, and we are thrilled to say to both Rob and Vicki: see you in August! On the fence about 2018? Read this. Posted 4:39 pm by ENDURrun & filed under 2018. “If you are sitting on the fence, all I can say is, ouch!”. If there is one unanimous piece of advice from ENDURrunners that we hear every year, it’s that training for the Ultimate is a long-term and substantial undertaking. That’s why we strongly encourage early entries through heavily discounted earlybird fees to the Ultimate every year. We really want you training for this event, yesterday. Today’s price is $400, which increases by $75 tomorrow and again to $550 by May. If you are among those looking at the page and wanting to do it, but but you’re just running out of time, we’re here to help. Use promo code ONTHEFENCE to extend this $400 price until Sunday, February 4. Use these extra four days to dot the t’s and cross the i’s and commit to making this August one to remember. Posted 12:30 pm by ENDURrun & filed under 2017. 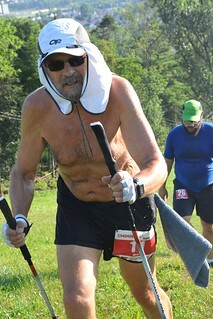 If you don’t know Patrick, he is an exceptional ENDURrunner. Not only does his 11:14:19 Ultimate in 2014 at age 51 rank as the 15th fastest of all time, but all faster times are by men 32 or younger. However, since his life has been turned upside down the last few years, he has looked to some constants – including his daughters and the ENDURrun – for strength. Here are Patrick Kelly’s thoughts during ENDURrun 2017, on the past, present and future. It’s 2012, I’ve just been handed some pretty crushing defeats, and I’m sitting in my dorm room thinking about where to go next. I thought I was in good shape but I wasn’t in the same league as the boys who were hammering me Stage after Stage. It was time for a new plan. This is when the idea of sub 2:50 at 50 started to take on a whole new meaning. I started to develop a plan that would get me to a sub 2:50 marathon early the next spring. Skip ahead two years to 2014: what a spectacular year. It started with a sub 2:45 in Boston, followed by a second place finish to Matt Leduc at the ENDURrun, then a 3rd in The County Marathon, and I finished off the year with the first place finish at the MEC marathon in the Gatineau Hills. Skip ahead two more years, to 2016. It’s March and I’m starting to experience some strange medical issues. Then on July 5 I have a stroke in my sleep, it wakes me and my life as I knew it took a turn sideways. I don’t take kindly to being held back, so on August 7, 2016, I toe the line for the first Stage of the 2016 ENDURrun with both my daughters, Hunter and Taylor. I am not able to run as hard as I would like because I am still waiting for testing and results for my medical mystery, which is still unfolding today. Watching Hunter and Taylor battle through the week could not have made me more proud. Now it is 2017: Taylor is handcuffed by a concussion. Hunter takes the year off, and I am learning how my body is going to react to higher levels of stress. Personally, the ENDURrun has been a rebirth of my competitive racing in 2012 followed by a new chapter in my running career 2017. The only thing I can say is watch out, in 2018, Hunter and I are back! We are relentless! Thank you for sharing this, Patrick. If we had a most improved category, it wouldn’t even be close. Posted 2:53 pm by ENDURrun & filed under 2017. It’s fair to say that Wilf Goron has had a pretty rough two-year stretch. Take a second to check out our all-time results, and enter the name “Wilf” into the search box. This alone tells quite a story. At first you can see that Wilf has run seven consecutive ENDURrun Ultimates, which is a record he shares with Jodi Kalman and Vicki Zandbergen. That alone is astonishing. But if you dig deeper into the times, you can see something even more amazing – Wilf’s rebound from his 2016 Ultimate time. Rewind to February, when we announced that we would be strictly enforcing the time limits going forward. This sent some shockwaves through the community as the ENDURrun had been allowing times to exceed the cutoffs without penalty. Part of the solution was a compromise, where some limits were raised. To those affected, this was a big deal. Wilf would have been one of those individuals – except that he didn’t even know! Back to that results page we showed you, and you can see Wilf’s progression over the years. A variety of injuries contributed to a lack of training that resulted in two years (2015 and 2016) that are substantially slower than his previous results. The newly interpreted rules meant that Wilf could not repeat these times, but Wilf had more intrinsic motivations to improve. Wilf got to work, as he had a phenomenally successful year training on a 3.6 mile loop 3-4 times per day. This week, he felt stronger every day, and by the time he became aware of the new limits and enforcement, the damage was already done. He able to knock well over four hours off his most recent Ultimate time (he doubled his goal of two hours)! We are currently researching this particular record, but this might be it. Wilf showed a year-to-year improvement that is unheard of. Congratulations, Wilf. He’s already signed up for next year, so the streak will continue! At a Stage 7 to remember, our winners stayed golden. Congratulations to our wire-to-wire Gold Jersey wearers! Vicki and Rob each came in as cumulative winners. Robert Brouillette ran the 3rd fastest ever time, his Stage 7 time of 2:36:36 bringing him just four minutes shy of the 10:02:55 time from 2003 he has been chasing all week. Second place today and for the week was rookie Nick Burt, posting an impressive sub-3 marathon and a cumulative time of 11:22:39, while Stefan Gudmundson was third overall in 12:16:28, for his third ENDURrun podium finish. Catherine Desrosiers won her third Stage in a time of 3:13:48, the fourth fastest marathon by a female Ultimate competitor. But ultimately, it was Vicki Zandbergen who held on for the cumulative win to set the 10th fastest ever time, 12:33:56, six minutes ahead of Catherine. Third overall was Valery Hobson in 12:54:30. This was only the third year in ENDURrun history that three women in the same field have completed the Ultimate in under 13 hours. The prize for the closest battle goes to Merzi and Thaddeus, who finished the week a mere 17 seconds apart! The top Relay runner at Stage 7 was Jonathan Redfearn of Orange is the New Fast (2:57:25). His performance moved his team into fifth place overall, but the top four spots were held by Health and Performance teams. The H+P Millenials regained the lead on the final day thanks to Nick’s race, while the H+P Masters Men finished second overall and H+P In Betweeners were third. The TEAM LLOYD competition ended up being very close, with TEAM LLOYD 1 coming out on top by just 4:13! The Sport competition also concluded today. Chris Ladubec was the top finisher, thanks to a 4:21:58 marathon. Joel Miller was second, and Sharon Ditner was third. Posted 8:50 am by ENDURrun & filed under 2017. As I write this, Sonja is running a marathon – a generally crazy way to cap a 118km week of racing. But she knows exactly what she’s in to, after all, she finished ENDURrun with her husband Kela, way back in 2008. Since then, Sonja Bissegger has kept ENDURrun in the back of her mind as she has grown her family, finished multiple Ironman triathlons, and finished her PhD. So when the opportunity came up to return in 2017 – with an 11 month old – she jumped at the chance. In her first year with her daughter Maëlle, she finds running easier than either swimming or running, so she signed up in January to return to a community that she remembers fondly. Sonja, a Kitchener native, is the type of runner that truly loves training, even more than the race goals. She uses races as motivation for the training, and especially for ENDURrun, likes how the week is essentially a training week. This won’t be an annual tradition for the family, but Sonja expects to return the event in a few years, and possibly even another Ultimate with Kela once their daughter is older! Sonja and Kela currently live in Kingston, where she works for a cutting edge biomedical startup which builds a bioreactor device that allows doctors graft healthy knee tissue from an unhealthy sample. We look forward to hosting your family again in a future year! We’re running out of time on these mini-profiles. Our goal was to share as many stories as possible, and this mission will continue beyond ENDURrun week as best as we can. Posted 9:09 pm by ENDURrun & filed under 2017. Lots to look for as our Ultimate and Relay runners enter their seventh day of racing! Male – Rob Brouillette has a commanding lead over Nick Burt (53:32). There is still a battle to complete the podium: Stefan Gudmundson has a 10:19 lead over a hard-closing Andrew Keeves for 3rd place! Female – Vicki Zandbergen has won four of six Stages, building up a 9:45 lead over second place Catherine Desrosiers, who leads Valery Hobson by another 5:26. This is the second-closest ever women’s race entering Stage 7 (2013). Relay – Health + Performance is dominating the podium right now, with teams fighting for first place (Masters Men lead Millenials by 6:00) and for third place (In Betweeners lead Women’s A by 9:18). Female – In a week of crushing PBs, Vicki Zandbergen (who sits 13th all-time after 6 Stages) can move into the top 10 all-time with a 3:17:05 marathon. Crazier things have happened! Joanne Bink owns the entire podium for Masters Women, but Catherine and Valery are knocking on the door; marathons of 3:13:47 or 3:08:22 respectively would gain either woman 3rd place in all-time Masters Women’s finishes. Relay – The H+P Masters Men need a 3:11:24 to maintain their 10th place position, which they sit in after Stage 6. There are two more teams within two minutes, and the H+P Millenials also have a great shot to reach the Top 10 all-time. The H+P Women’s A team is 1:42 back of their time from last year, which is the current record for fastest ever all-female Relay team. A 3:12:39 marathon is what it would take to best their own record! ENDURrun Bests – There are several Ultimate contenders this year who are running their best ever ENDURrun week, besides Vicki and Rob. Thaddeus Homewood, Merzi Dastoor, Valery Hobson, Trish Benoit and Rebecca Kruisselbrink are all competing in the Ultimate for their second time, and all five of them have run ENDURrun bests at almost every stage! Will Spaetzel is also running his second Ultimate, and is currently 7 minutes ahead of his 2013 result, thanks to a huge 27:34 PB at Chicopee. Amanda Booth (third time Ultimate competitor) is also currently 6:36 ahead of her own 2016 performance. Interesting fact: both Merzi and Amanda ran exactly the same time in their 10KM TT this year as they did in their last Ultimate competition! Year over Year Improvements – We’ve already covered Michelle’s close races against the cut-off clock, but that doesn’t mean we’re done talking about how great her races have been this year! Michelle is currently 1:21:18 ahead of her 2016 self! Wilf Goron is also having a fantastic week, his fastest ENDURrun since 2013! He is on pace to run over 4 hours faster than his 2016 self! Middle of the Pack Relay Competitions – Orange is the New Fast, currently sitting sixth, has a strong marathoner in Jonathan Redfearn, and is 21:01 behind the Women’s A team (fourth), with the RC Wed Knights in between. TEAM LLOYD 1 and TEAM LLOYD 2 are only 7:10 apart after Stage 6! What can April Boultbee vs. Patrick Campbell add to this unexpectedly close battle? In which Denis Allen issues a colossal challenge – to himself! Posted 6:25 pm by ENDURrun & filed under 2017. Denis Allen’s primary annual goal is to stay healthy. On the verge of his fourth Ultimate finish, never has his worldview been so simple. Running and personal health are two sides of the same coin, and Denis knows he’s successful if everything clicks for his main event – the ENDURrun Ultimate. More than anything else, the camaraderie and community has helped to establish the event as an annual highlight – a “fitness vacation” – and Denis uses the event to set big, concrete personal goals. When he signed up in January 2017, it set in motion a larger plan. Seven months later, he has seen great success, and has lost about three-quarters of the way to his ideal race weight. Stage 7 will determine whether or not this year is his slowest ENDURrun, but even as injuries have gradually grinded him down over the years, he’s on the bounce-back and his outlook is rightly positive. He credits Run Waterloo in general with helping to nurture his love of the sport. Denis has already committed to be back next year, and he has big plans to compete with his 2011 self (his fastest Ultimate). But for this fall, his eyes are squarely focused another longtime goal: the sub-20 5k. 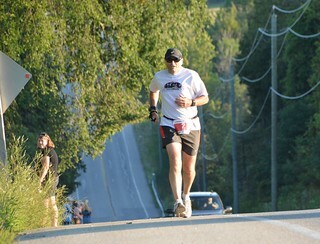 He has had varying degrees of success over the years, but his current PB – 20:21 from the 2010 Laurier Loop – has to go. If he can’t do it on his own, he is determined to get help, which will probably include joining Health + Performance! These ambitious goals will make ENDURrun 2018 his best, ever, and we are super excited for it!